So you tried the 7 day free trial and like 85% of people liked what you saw and stayed. What now? The following is some suggested goals. Goal 8:- Start enjoying the financial rewards. 1) Become familiar with your GDI members site. This is your portal into the GDI world. Its where you will find your hit logs, your banners, your affiliate information, your access to the forum, your commissions records, leaders boards and bonuses, set your payout options and your email/hosting options to name just a few. Its also where you can access the site builder. Get use to where everything is so you can check on your progress. The hit logs can tell you how your advertising is going. 2) Build your own website. Global Domains International is more than just a business opportunity the product is the domain name, hosting package and lots of other options. If you use the inbuilt site editor you can produced a 10 page website. 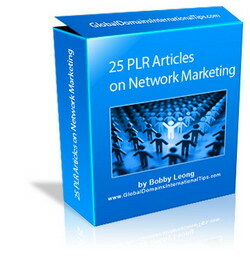 Use it to advertise any other online business or MLM you might have. If you don’t know what to do with it then do a page about your interests and add adsense. A good website with traffic and generate a nice income on its own, let alone added income from your down line. 3) Get your first member. If you advertise you which get hits to your hit log. Ezine advertising, forum posting, articles, whatever it takes get the word out there both on and off line. Eventually you will get an email from Global Domains International which says “Congratulations (your name here) you have a new sign up!” If you can do this once you can do it a thousand times. Although a website can earn money in itself (through adsense, affiliate marketing, etc) its nice to get 10 members in your down line. 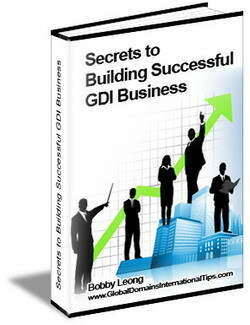 You GDI website and total package is now FREE – it costs you nothing and any new members mean one thing – money in your pocket. Robert Kiyosaki taught me an asset is something that puts money into your pocket. Once you GDI has ten members ITS AN ASSET. 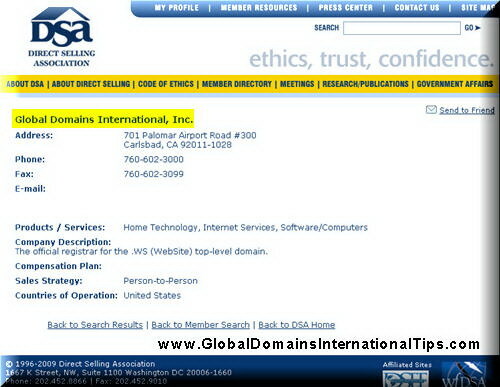 To be really successful with Global Domains International you need to be able to teach others to repeat your success. Helping them grow not only means more money in your pocket – it brings satisfaction. In fact I get more excited when one of my down line sponsor a new person than when I do – because I helped them achieve their goals. 6) Get your down line to 5 levels and sponsor 100 people personally. By getting your down line to 5 levels you not only have taught your 1st level how to grow, but you’ve taught them how to teach others as well. Getting to 5 levels means you’ve made it and done it the right way. 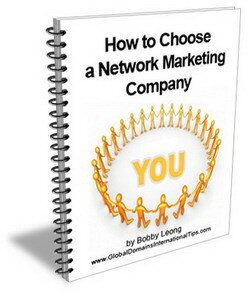 Now get your front line to 100 people you personally brought in. If you do this your Global Domains International income will be making a significant difference to your monthly budget. Reward yourself with an overseas trip, or buy a car for your business. You are now executive and should treat yourself like one. 7) Brag about your success. By giving your testimony about how well you have done you will attract lots more people to you. Successful people attract people who know that by following their formula they to can share in that success. You growth will explode even further. Start enjoying the financial rewards. What’s money but to build the lifestyle you and your family want. Global Domains International rewards those affiliates who have a down line of greater than 5,000 members an infinite level – that means your levels will go down pass the five level barrier meaning big money – GDI returns up to 60% of the income earned back to successful affiliates. Impossible you say – no – I know people who have personally sponsor 800 and have a down line of 12,000 – thats 12,000 a month US recurring – 144,000 a year – thats SERIOUS income, plus the bonuses you will have earned on the way. Whats stopping you – stop complaining about your boss, that lifestyle you can’t afford, etc, etc and do something about it – Get your freedom today.